Catriona Matthew’s appointment as Europe’s Solheim Cup captain for the 2019 match at Gleneagles has been warmly welcomed by former world No. 1 Annika Sorenstam. The North Berwick woman has been hailed by Sorenstam as the “natural choice” after playing nine times against the Americans in the biennial event. Matthew, who went to Des Moines as one of the Swede’s vice-captains, picked up three points from four after stepping in as a late replacement for the injured Suzann Pettersen. 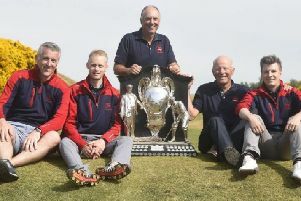 That wasn’t enough to stop the home side from retaining the trophy but now the 48-year-old has opened a new chapter in the event after being handed the reins on home soil. “I am very happy that Catriona has been chosen as the next captain,” said Sorenstam, who partnered the Scot on her debut in 1998 at Muirfield Village. “She has had a wonderful Solheim Cup career and she deserves the opportunity to take on this prestigious role. Matthew’s appointment for a match being played over the PGA Centenary Course, scene of Europe’s Ryder Cup victory in 2014, was also given the thumbs up by First Minister Nicola Sturgeon. Matthew is only the second Scot to be handed the honour after Fifer Dale Reid, who controversially left out Matthew for the 2000 match at Loch Lomond. “I had said I was keen to do it and perhaps put my name forward,” said the Scottish No. 1 of having intimated she’d be keen to take on the captaincy straight after Gleneagles was announced as the venue in October 2015. “But to find out so early on and so quickly after Des Moines (where the Americans retained the trophy last month) was fantastic, a dream come true. “It’s something I’ve always wanted to do and to have the opportunity to do it in Scotland makes it doubly special. With 22 points, Matthew is the third most successful player in the event after Laura Davies and Sorenstam, but she has ruled out the possibility of having a chance to jump above them at Gleneagles.